Full disclaimer: I am a Vendio employee and a member of the marketing team. However, I am also a reformed (okay, reforming) shopaholic with a penchant for designer jeans. I just re-opened my Vendio Store to try and reduce the size of my burgeoning closet and thought I’d share a few tips learned along the way. (1) Set-up profiles first. 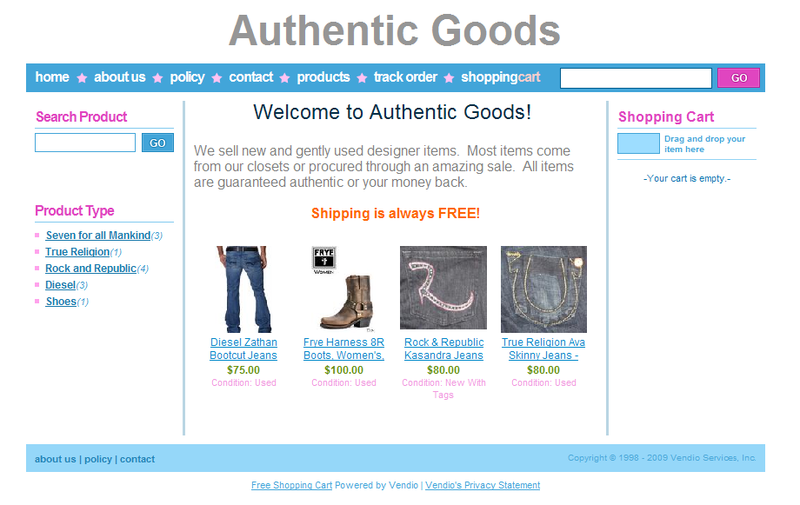 The Vendio Store has profiles for everything that you commonly use – from shipping to policies. Once you have a profile set-up, you can plug it into any item and focus primarily on the description. This also allows you to focus on writing short, concise descriptions. Creating profiles takes less than a minute and will save you hours. (2) Use the “short” listing format. Vendio is really powerful. While it can’t leap buildings in a single bound, it CAN list items to eBay, Amazon and your Store using one listing form. And that, admittedly, can be a little overwhelming. 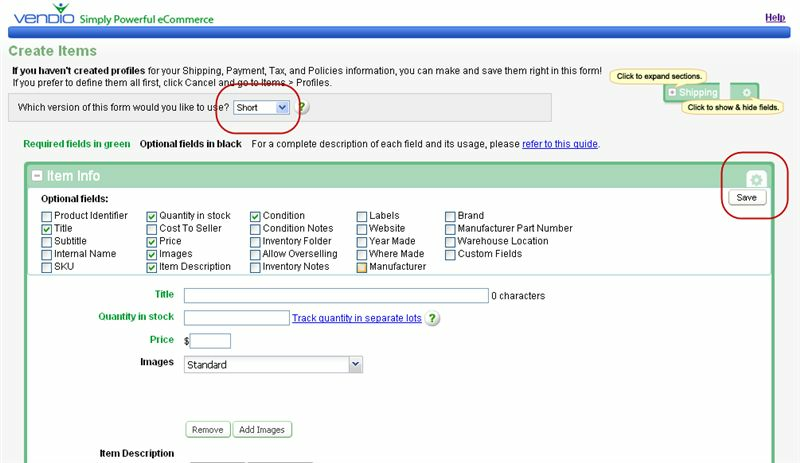 Therefore, if you’re like me and are only planning to sell in your Store and maybe eBay, then select the short form and use the handy gear icon to get rid of fields you don’t need. I learned that having a short, concise listing format helped me focus in on what’s important: photos and a great description. Choose the “short” listing format. These are fields that you don’t have to manually fill-in (woo hoo). Simply choose from the drop-down menu which profile you’d like to use and you’re done. (3) Xpress Publisher plus Image Folders = HUGE timesaver. Sure you can get fancy and create folders for every single product line, but for me, all I needed were two: Unfiled and Listed. Using Xpress Publisher, I was able to upload folders of photos in seconds. As I listed the items, I moved used photos to Listed. This eliminated my need to scroll through pages of images. Creating is easy. 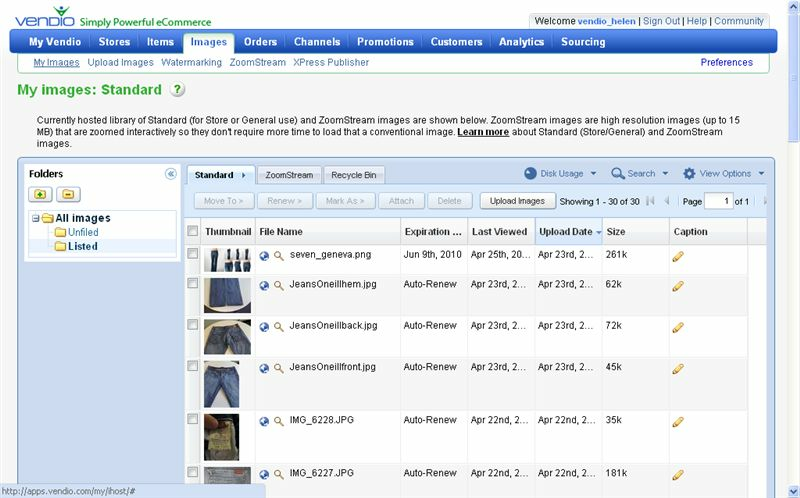 Uploading images into them via XPress Publisher is even easier. (4) Create a free banner and add a “feature image”. When I first opened my Store, I used only text. I thought it looked pretty good. I wanted to focus on listing my items first and then Store design. Once I had a few more items in, I thought it would be fun to create a brand identity for my Store. I found a free resource called “Banner Fans” that allows you to make your own banners either with an uploaded images or from scratch. Super easy to use (though a word of caution: choosing fonts can be a huge timesuck). Here are the before & after photos. 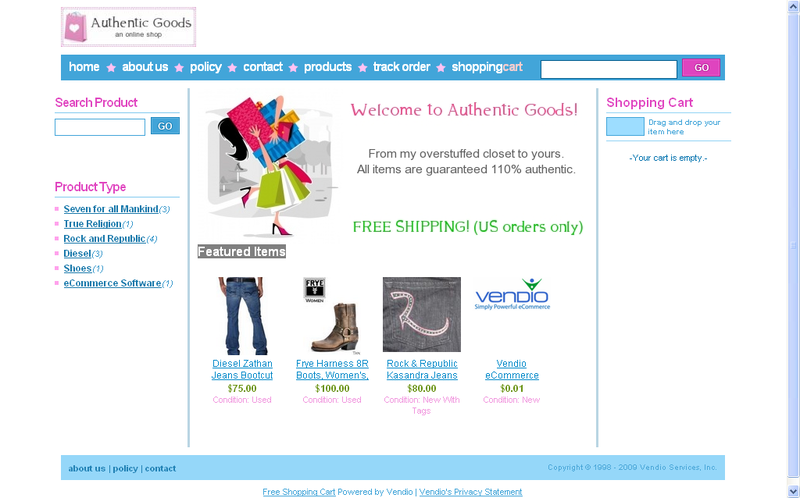 Before: I used a pre-existing Vendio Store template and made a few minor tweaks. It took me no more than 10 minutes to add my text logo, some promotional text and featured items. After: I didn’t use any fancy design software. Just a free banner maker and my own imagination. 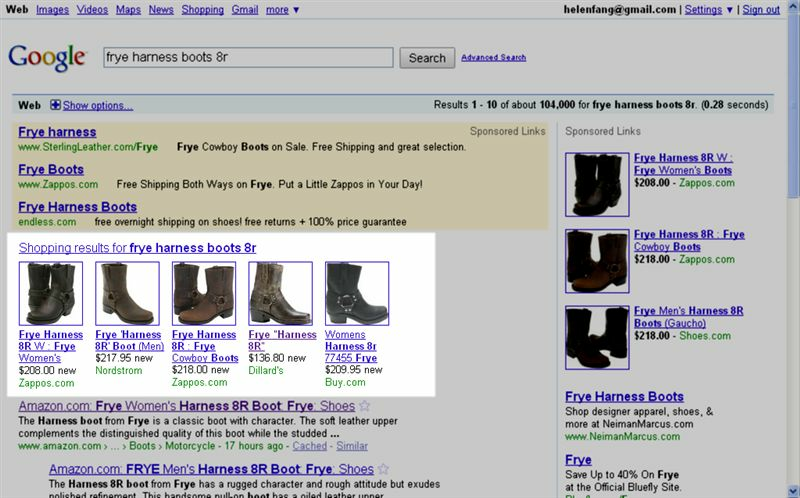 Google Product Search is a comparison shopping engine. 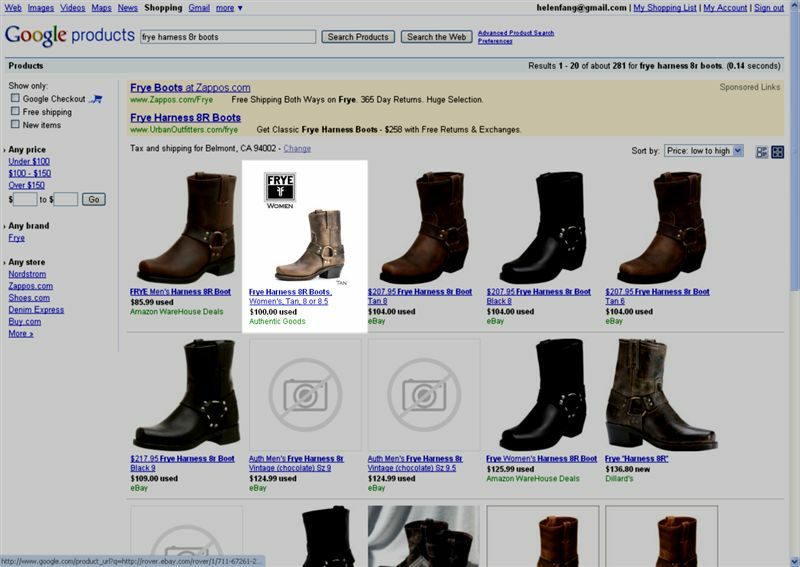 Comparison shopping engines are similar to marketplaces like eBay or Amazon in that they help drive shoppers to your products. Unlike marketplaces, however, CSE’s only drive traffic to your website and most charge for this traffic on a per click basis. What’s unique about Google Product Search is that it’s completely free (hey, sort of like Vendio Stores). Another huge benefit is that Google integrates Product Search in its Google.com search results. That’s a lot of potential eyeballs on your items. Google integrates Product Search very prominently on search results page. An actual item I’m selling listed along major retailers. Very cool! This is a fantastic product for sellers, especially small sellers who can now compete side-by-side with the Internet’s top retailers. My used, sometimes new items are now listed alongside those from Amazon, Zappos, Nordstrom and more. That’s pretty cool. Better yet, Vendio submits the feeds on your behalf. It only takes a few minutes to set it up. However, Google has its own rules about what it will and will not accept. Therefore, to comply, the easiest thing to do is to keep things simple. Listing on Google Product Search is not like listing on eBay. Don’t capitalize or include incentives (e.g. free shipping) in your titles. Make sure to fill in the item condition field. If you follow these two rules, I can almost guarantee that your items will be distributed. Lastly, a quick “Happy First Birthday” to us! One year ago, we launched our new eCommerce Platform which had a brand new Store and included Amazon automation. 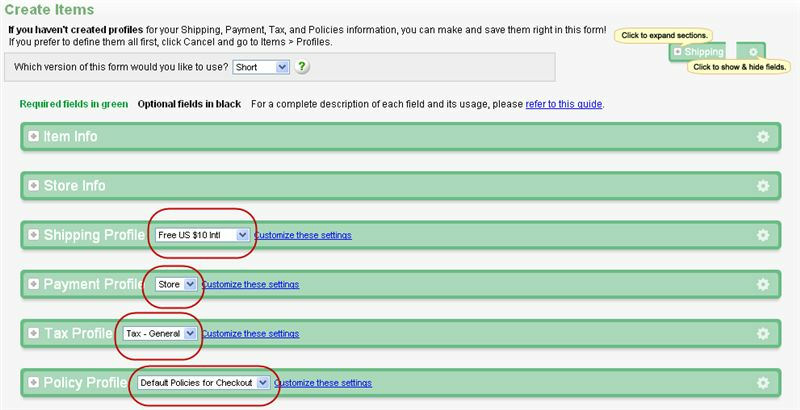 Since then, we’ve made many feature enhancements in order to make your selling online experience as easy as possible. So, if you haven’t checked us out in a while, please do so, I think you’ll be pleasantly surprised. I’d love to hear your thoughts and experiences with setting up your Vendio Store. Got any tips to share? This entry was posted on Thursday, April 29th, 2010 at 8:00 am	and is filed under Selling Tips. You can follow any responses to this entry through the RSS 2.0 feed. Both comments and pings are currently closed.